"This kit is amazing the way it fits together so well. Everyone that has helped has commented on how fast it goes together. The design is just brilliant!!" "I chose the Spirited 480 as it possesses the perfect balance of performance, build system, comfort and aesthetics. To date I have not come across a design that surpasses it and 'Roam' is the ultimate Global Adventure Vehicle for us". "I found the SAS kit system an efficient and easy method to build as compared to other traditional build techniques. I love every part of my Spirited 380 and have enjoyed the project. The support from Spirited Designs has been first-class and I always felt that help was close at hand. 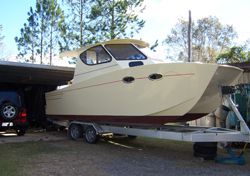 I am looking forward to now starting the next stage of my adventure on ‘Tasha’"
"I have been searching for an ideal boat for some time, checked almost each and every manufacturer / designer worldwide and at the end found Spirited 230 to be the one for so many reasons such as proven engineering, compact layout, trailerability, efficiency and so on." "Just a quick update, the boat is going very well, we now have a large steel shed on Bribie and 'Jigsaw' resides in there. Launching is great; this has a central floating section so I don't get wet at all, so different from the tinny! So far Jigsaw has behaved very well in all manner of weather including towing a broken down boat from Moreton Island to Spinnaker Marina! Will keep in touch." "The boat performed very well. Cruises comfortably at 22 knots with a top speed of 27 knots. We launched in Pumicestone Passage and cruised out against 20 knot south easterly winds with 1 metre chop. Ride was very comfortable. 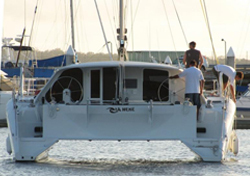 Peter & I are very pleased with her and we are planning on a few more trips across the bay." 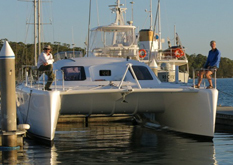 "Why we chose the Spirited 380... - At the Sanctuary Cove boat show in 2006 we were mesmerised as we wandered through the Spirited 380. 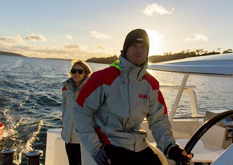 We were looking for a vessel to undertake a two year surfing and diving adventure around the coast of Australia and on to south east Asia and the Indian Ocean. In the midst of the beautiful boats Australian boat builders/designers had to offer, the Spirited 380 clearly stood out. We were attracted to her sleek and elegant design, her modern, comfortable living space and her sailing ability as a light, fast cruising boat which can sail anything from light breezes to open ocean gales. We are elated with "Zinc", the 7th Spirited 380 to hit the water on Oct 08, and we are certain we made the right choice!" "...The Spirited 380 was the only design that we could find that fulfilled all our requirements and ease of construction..."
"Hi Craig & Marina, it gives us great pleasure and enormous anticipation to receive the plans of your Spirited 380 last month. Greg & I have researched extensively for a very long period and the Spirited is the closest thing that we can find to perfection. Greg was looking for a high performance catamaran and, as this will be our home, I was looking for luxury and comfort and we were both wishing for ease and swiftness in the build time. The Spirited 380 offers all of this and more. We viewed Rob Armstrong’s catamaran-in-process and were astounded at the progress that he had made in the first 15 weeks; the shell of the boat and a lot of the furniture were already assembled and it looked fantastic. After attending your workshop at Yandina (Jul 7th), we were convinced that even I (as a woman) was capable and able to master the skills required. (Well maybe I might need a little help from Greg). We are very grateful for the approachability of both you and Marina, your willingness to make minor alterations to meet our specific requirements, and your prompt replies to all of our queries. We look forward to continuing our relationship and enjoying the next few years of our Spirited Experience." 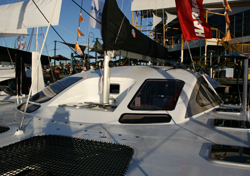 "Hi Craig & Marina, I am writing this to let you know how much we enjoyed seeing the Spirited 380 at Sanctuary Cove 07. 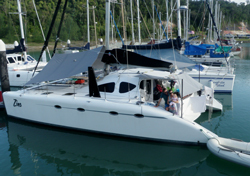 As you know I am a pilot that has decided to sell his plane and go sailing, catch is, my sailing portfolio is very limited, so I have spent months checking out all the latest Catamaran designs (Light wave, Fusion, Seawind, Lagoon, Tasman) all beautiful boats. I then went to one of your workshops and was blown away by the ease of building the 380, something I will be able to do easily (even at 74), then we called in to see your ¾ finished 380 and I just fell in love with the boat and decided that I would just have to have one. I have been like a cat on a hot tin roof, waiting to see the finished 380 at Sanctuary Cove, and it proved to me that I have chosen well. Definitely it is the prettiest Cat on the water today. The important features are the completely flat Deck, so safe to move around on, no other Cat has that feature, the bunks have almost twice the headroom of any other Cat, the saloon is larger than most and the cockpit is just perfect! The engine is outside the boat with a very large engine hatch for easy access to everything mechanical. Another thing we loved is the steering position; you can see both Bows from either side through the large roll down windows, a definite safety measure. Once again, congratulations on designing such a fantastic Catamaran. My wife and I can’t wait to join the growing family of Spirited 380 builders. Best Regards."